Photos by David Karp and Toni Siebert, 12/1/2008, CVC. Photo rights. Bottom photo by Siebert, 2016. Source: Received as seed from Prof. K. Mendel, Volcani Institute Rehovoth, Israel, 1966. Rootstocks of accession: Own roots. Monoembryonic. May be too tender for the field here. EMN, 11/1986: Field tree died, keep in GH & LH only.
" The original description, as translated, reads: "Tree, about 20 m tall, very glabrous. Twigs rather thick, on drying black, young ones hollow or spongy ('fistulosus'). Leaflets unequal, ovate or ovate-elliptic, somewhat obtuse, or subacuminate, acute at the base, crenulate, 4-7 cm long, 3.5-5 cm wide, on drying fuscous, black-punctate; lateral petiolules 7-10 mm long, intermediate terminal ones up to 15 mm long; the common petioles 2.5-3 cm long. Panicles 2-4 cm long, contracted; bracts very small; ultimate pedicels up to 4 mm long, rather thick. 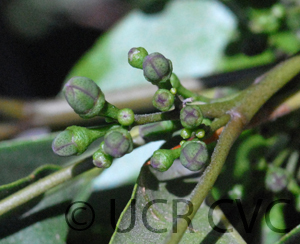 Calyx up to 2 mm long, segments broadly ovate, acute, somewhat thick. Petals white, 5 mm long. Filaments 2 mm (or a little more) long; anthers scarcely 1.5 mm long. Fruit up to 13 cm long, 11 cm wide, cortex 5 mm thick. Seeds up to 16 mm long, 10 mm wide, 8 mm thick. Unyoro, Budongo Forest, Dawe 788." 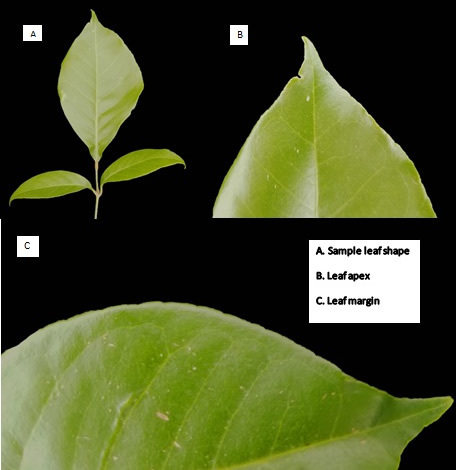 Eggeling, in his work on the forest trees of Uganda, stated (1940, p. 205): "Deciduous forest tree, 70 ft.; flowers greenish-yellow in contracted axillary panicle, 2-3 in. [50-75 mm] long, petals 1/5 in. [5 mm] long [sic], very odorous, woody (shell 1/5 in. 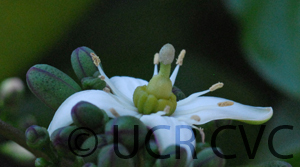 [5 mm] thick); yellow-orange when ripe, ovoid globose, up to 5 1/2 in. [13 cm] diam., 6-8 locules; seeds several per locule, about 2/3 in. [16 mm] long. Wood yellow-white, even in grain, hardy, nailing badly but not splitting, difficult to saw, planing badly, turning well, taking a good polish; weight 52 lbs. per cu. ft. air-dry." 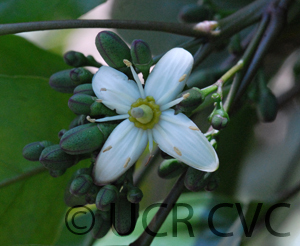 This remarkable Citrus relative is native to the plateau of Uganda, East Africa, to the east of Lake Albert, at altitudes of 600 to 915 meters (2,000 to 3,000 ft.), where it attains a height of about 25 meters (82 feet). Seeds were collected by M. T. Dawe from the type locality and sent to Swingle at the former Bureau of Plant Industry before World War I. Under culture in the greenhouse it grew freely, but even after many years did not flower. Balsamocitrus dawei can be propagated easily by grafting on seedlings of Aeglopsis chevalieri (which fruits freely in the greenhouse) and twigs can be forced to root by the so-called nurse-grafted Y-cutting method (Swingle, Robinson, and May, 1929, p. 79), where one fork of the Y is grafted on Aeglopsis until the base of the Y strikes root. It is highly probable that Balsamocitrus could be grafted also on the species of Afraegle and on Aegle as well, as it is closely related to both of these genera. 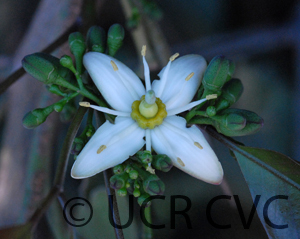 As it is one of the largest trees among the Hard-Shelled Citroid Fruit Trees (subtribe Balsamocitrinae), it should be tested as a stock for Aegle, the bael fruit of India, the most important widely consumed species in the subtribe but one that has proved difficult to grow on its own roots in the United States. "